AMC today announced that it has ordered a second season of its Revolutionary War drama, Turn, which attracted a passionate core audience averaging 2 million viewers a week over its initial 10-episode run. Turn will return to AMC with 10 new episodes next spring. The network is also pairing encores of the entire first season of Turn with Hell on Wheels on Saturday nights this summer, to give new viewers a chance to discover and connect with the show. AMC president Charlie Collier had this to say about the renewal in a statement. "Craig Silverstein, Barry Josephson and a talented cast and crew delivered a truly distinctive and engaging premiere season. We look forward to continuing this revolutionary journey into Season 2. AMC and its creative partners have a track record of nurturing programs we collectively believe in, patiently growing viewership and engagement over time. With Turn, once again, we dive in with our partners to build upon this very promising first season." On a very competitive night, the Turn finale delivered 2.2 million viewers, live+3, including 792,000 adults 25-54 and 706,000 adults 18-49. A character-driven drama set during the Revolutionary War, Turn takes us behind the battlefront, to a shadow war fought by everyday heroes who vowed to keep their heroics a secret. Based on Alexander Rose's book "Washington's Spies," Turn centers on Abe Woodhull, a farmer living in British-occupied Long Island, who bands together with a disparate group of childhood friends to form the Culper Ring. Together they risked their lives and honor, and turned against family and King, for a fight they believed in passionately, ultimately helping George Washington turn the tide of the Revolutionary War in favor of the rebels. Their daring efforts also revolutionized the art of espionage, giving birth to modern tradecraft as we know it today, along with all of the moral complexity that entails. Turn, from AMC Studios, is executive produced by Craig Silverstein (Nikita), who also serves as showrunner, and Barry Josephson (Bones, Enchanted) from Josephson Entertainment. 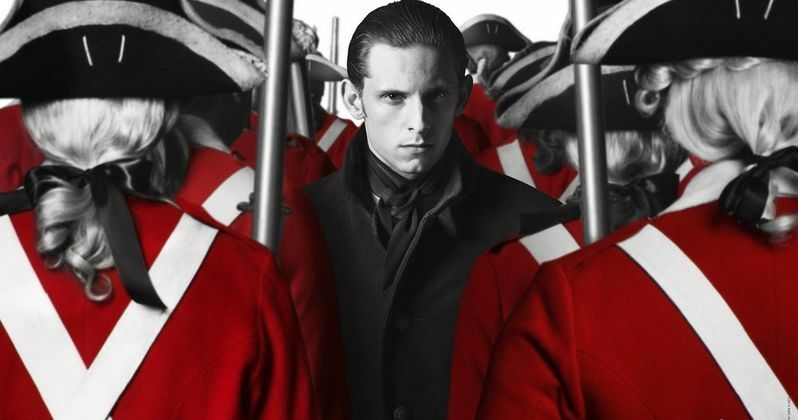 The series stars Jamie Bell as Abraham Woodhull, Seth Numrich as Ben Tallmadge, Daniel Henshall as Caleb Brewster, Heather Lind as Anna Strong, Kevin R. McNally as Judge Richard Woodhull, Meegan Warner as Mary Woodhull, Burn Gorman as Major Hewlett, Angus Macfadyen as Robert Rogers, JJ Feild as Major John André and Samuel Roukin as Captain Simcoe. Turn is distributed internationally by Entertainment One Television (eOne), through an exclusive multi-year output agreement.